Throw away the blue, plastic milk crate on wheels! The RepRoller is designed by a woman and it is easy to lift and durable. Excellent for clinical experts, diabetes educators, teachers, pharmaceutical sales, medical device sales, contractors, stylists, and anyone on the go. 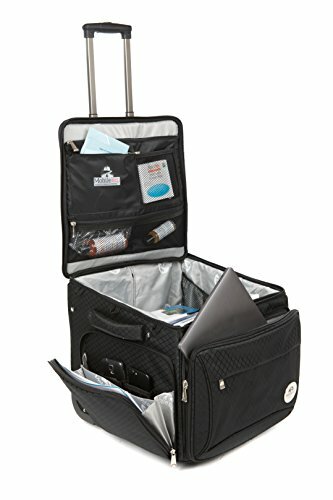 It is built to maximize productivity by organizing everything in one easy to pull and pick up sales bag. It is ergonomically designed with soft grip handles that allow you to lift from he sides or directly from the top in and out of your trunk with ease. The large inside compartment keeps supplies safe and damage free along with side pockets for cables and supplies. An expandable file folder inside also keeps important papers organized and protected from bending or wrinkling. The office cart is durable with reinforced construction that can hold up to 75 lbs and wheels that are strong enough to navigate steps with no problem. Storage capacity is very large and the measurements of the bottom of the bag is 16 inches x 15.5 inches. Extra bungee cord loops on the top edge provide even more storage capacity. The backside of the cart also has basketball type material that protects the cart from damage when pulled up steps. The handle gives a little to allow it to pull up to 75 lbs when fully loaded. This cart is designed to keep you moving! If you have any questions about this product by MobileRep, contact us by completing and submitting the form below. If you are looking for a specif part number, please include it with your message.